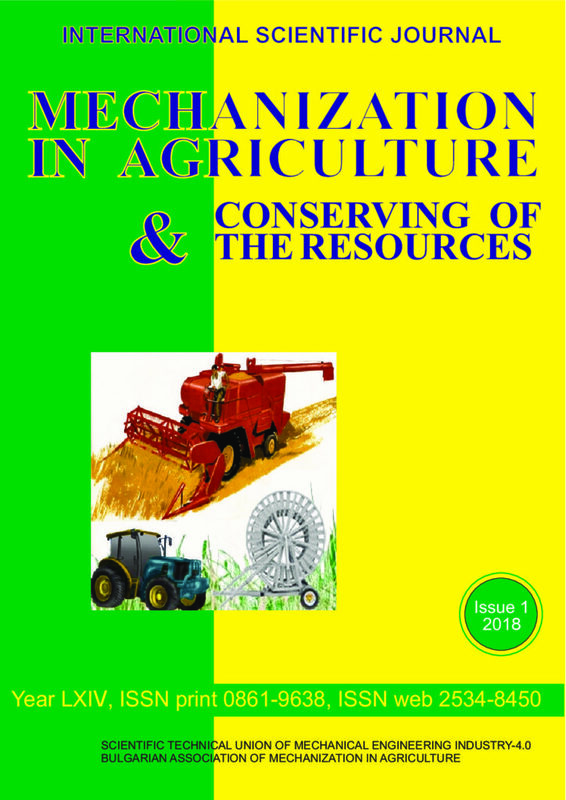 The work is devoted to the investigation of the peculiarities of aggregation of wide-span tractors (vehicles) with agricultural machines and implements. As a result of the conducted studies, it has been established that, from the point of view of the control impact (the turning angle of the driven wheels) and the disturbing impact (the turning angle of the mounted implement in a horizontal plane) exerted by the wide-span tractor, the most desirable is such a variant of configuration of the mounted device in which the instantaneous centre of rotation, formed by the convergence rays of its lower links, is in the centre of the mass of the tractor. When using wide-span tractors (vehicles) with mounted implements of the high 4N and 4 categories in accordance with the ISO 730: 2009, one should consider a possibility to configure them both for a three-point and a two-point scheme. The article deals with the milking machine vacuum system which is designed for the vacuum level control with a special reducing valve. Vacuum Milking machines with the vacuum pumps without frequency converter have the constant rotation speed and vacuum level is controlled by the control valve. By using the frequency converter for controlling electric motor of vacuum pump the electric energy consumption significantly decreases but the vacuum fluctuation is higher. The vacuum pump of the designed vacuum system is connected to the air container. The vacuum level of the air container is controlled by the frequency converter on a higher level than the level of the milking vacuum. Newly designed reducing valve is placed between the air container and the vacuum pipeline system of the milking machine. The reducing valve controls the air which flows through it and the vacuum is reduced on the required level and is stabilized. But the energy consumption is a little bit higher. The system of the servicing of the machines in the livestock farms has been analyzed and the necessity of optimizing the spare parts services and the scope of the workshops for maintaining the equipment in the livestock breeding. Relations have been developed to optimize the area to be serviced by the workshop and its spare parts warehouse, as well as the optimal average distance to be found from where machines work. The main physical soil properties are considered highly important for soil fertility. Measuring soil moisture, in-depth soil hardness and soil density can help in choosing an appropriate soil tillage method. The paper shows a practical handbook, which can be used with addition to soil moisture meter and a hardness meter to reach these conclusions. The selection of the tillage method is done by using a paper disk, provided in the handbook, showing good tillage practices. Bulgaria is the EU’s leader in increasing the number of organic producers over the last five years. The types of crops with the largest share in the structure of organic areas of all areas in our country are respectively ¾ of the areas including permanent crops, Technical crops, meadows and pastures. The remaining ¼ occupy grain, vegetable, essential oil and fodder crops. In relative terms, however, the most widespread is the production of leafy vegetables and grazing, and the areas occupied by these crops are almost entirely grown in this way. More than half of the areas with berry crops (except strawberries) are certified as organic or in transition. Areas planted with some perennial plantations and essential oil and healing crops also occupy a larger share. An important requirement for the objectivity of the financial analysis is the reporting of the comparability of the source information for the reporting period with the relevant data from the financial analysis entities. It is imperative to take into account the distortive influence of all the factors in order to achieve correct and sustainable conclusions: agrotechnical; natural and climatic; socio-economic.